These were good...finger-licking good! They were so simple to make but so tasty. I served them with some brocoli and baked potatoes. But they would be great finger food to serve at a party too. 1. Heat the oven to 220C. Slightly bruise the dried herbs. Season the little drumsticks with the dried herbs, cumin, and salt and pepper. 2. Bake the chicken drumsticks for 20 to 30 minutes, or until the drumsticks turn golden brown. 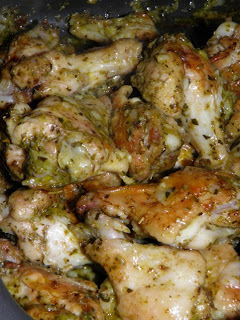 While the drumsticks are baking, mix together the oil, basil, garlic, parmesan cheese, and salt in a small bowl. 3. When the drumsticks are cooked through, toss them with the garlic/cheese mixture sauce.